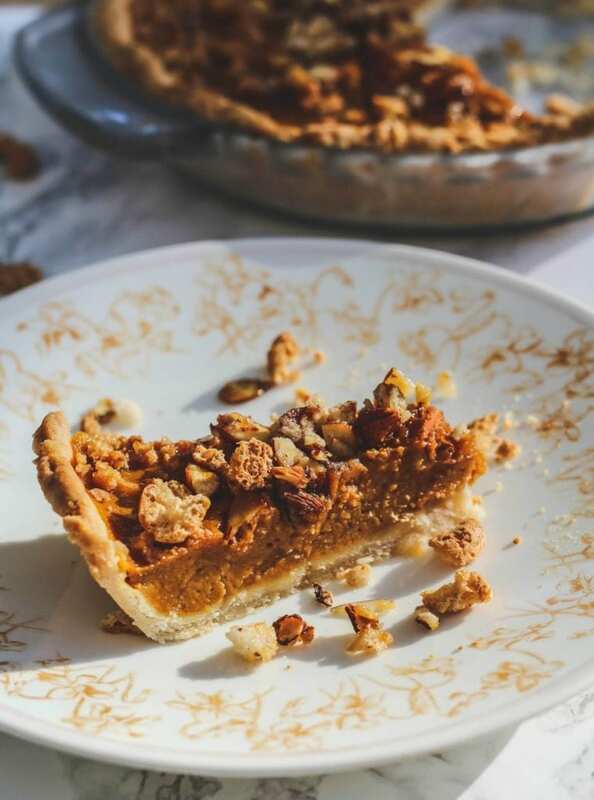 Amaretti Almond Pumpkin Pie is all I’ve been thinking of this weekend!! I’ve also been thinking about some turkey recipes, but this pie!! 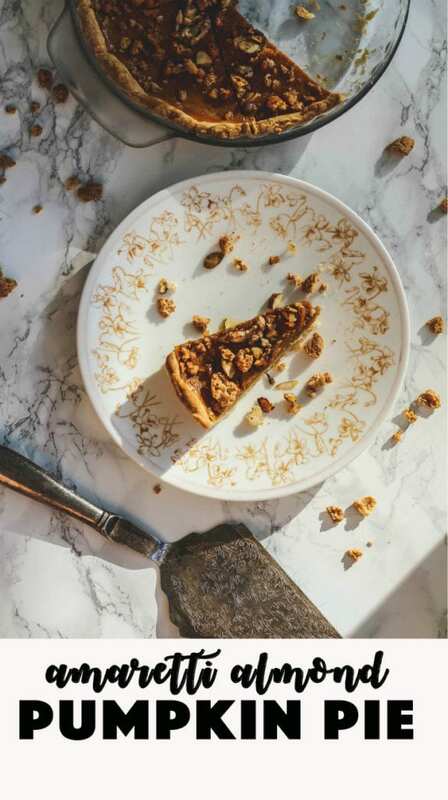 The crushed amaretti cookies and almond praline makes for an unforgettable and unconventional pie! You may be in the midst of your Thanksgiving menu planning. Or perhaps you have had your menu ready since July. 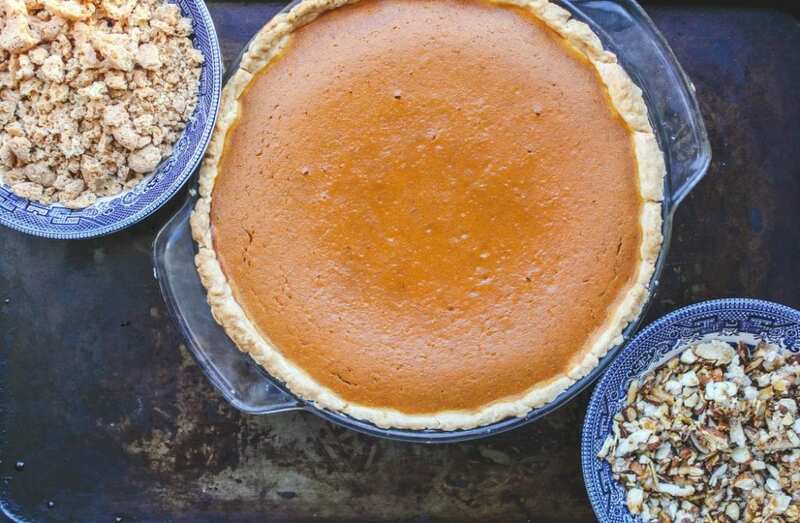 Whatever the case may be, you could be dreaming of a different way to surprise your guests with a pumpkin pie. No offense to a typical pumpkin pie. We happen to be HUGE pumpkin pie fans. As soon as the temperature drops just slightly here, my kids begin to ask, “When are you making a pumpkin pie?”. I can’t make a pumpkin pie until at least the end of October. But they are ready even in September. They will have a slice even for breakfast!! This amazing pie will be on the menu for sure this Thanksgiving. I also will make this chocolate espresso pecan pie and most likely this cranberry cake. I will make this vegan maple apple-cranberry crisp for my vegan friends. I’ll make 2 pumpkin pies: one vegan and one not. I usually make 2 or 3 pies and one cake. We have about 20 people over every Thanksgiving and that seems to be the right amount of dessert for all the hungry Italians! If you want to make this a vegan pie, omit the amaretti cookies and follow this recipe. Just add the almond praline on top. HOW MANY DAYS AHEAD CAN YOU MAKE A PUMPKIN PIE? You could make a custard type of a pie like a pumpkin pie 2 days in advance. Bake your pumpkin pie and let it cool on the counter. Cover it and it will keep well, loosely covered, in the fridge for up to two days. You could even blind bake the crust and freeze it until you’re ready to bake it with the pumpkin filling. I like my pie at room temperature and I like to bake it the day of Thanksgiving. HOW DO I KNOW I FMY PUMPKIN PIE IS DONE? I do not use a knife to test if my pie is done. It will crack the pie. I carefully jiggle my pie. It is usually ready at the 60 minute mark and no longer jiggles. 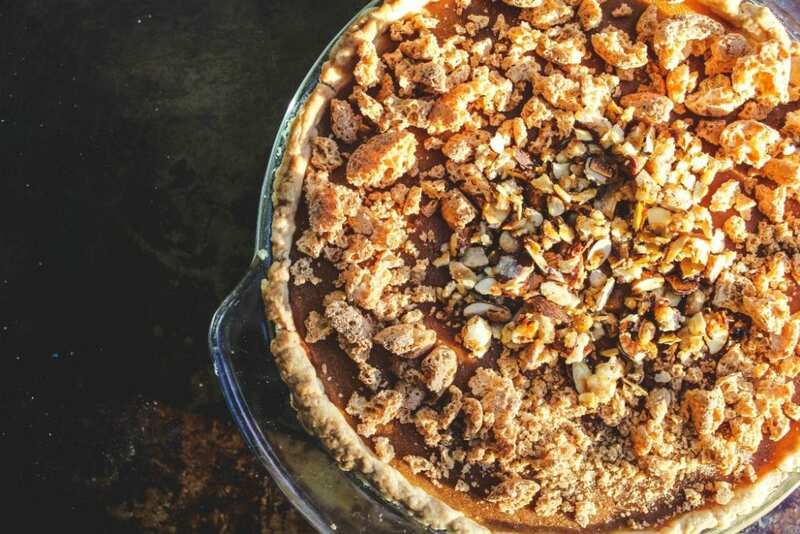 CAN YOU MAKE A PUMPKIN PIE WITHOUT EVAPORATED MILK? You can substitute 1 1/2 cups of cream or half and half (or a combination of the two). You can also use milk (or even almond milk). Simply add 1 tablespoon of cornstarch with the sugar and spices to help the pie set up. 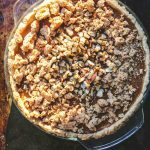 Amaretti Almond Pumpkin Pie is a new twist on a Thankgiving favorite! 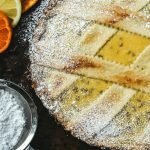 If you love almond flavor, you'll love this pie!! Combine flour, salt and sugar in a food processor; pulse it one time to mix. Add the butter pieces and pulse 4 times. Add shortening one tablespoon at a time and pulse each time you add a tablespoon. The mixture should resemble coarse cornmeal, with butter bits no bigger than peas. Sprinkle 6 tablespoons of ice water over flour mixture one tablespoon at a time. Pulse once after you add each tablespoon of water. If you pinch some of the crumbly dough and it holds together, it’s ready. If the dough doesn’t hold together, keep adding water, a teaspoon at a time, pulsing once after each addition, until the mixture just begins to clump together. Clean off your counter really well or use a pastry board or a nice cutting board. Flour your hands generously. Take the dough out of the food processor. On a lightly floured surface, using a rolling pin, apply light pressure while rolling outwards from the center of the dough. Every once in a while you may need to gently lift under the dough You have a big enough piece of dough when you place the pie tin or pie dish upside down on the dough and the dough extends by at least 2 inches all around. 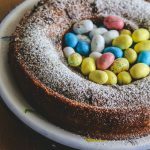 In a medium bowl, beat the eggs slightly with a wire whisk. Beat in the remaining filling ingredients. Pour the filling over your pie crust. 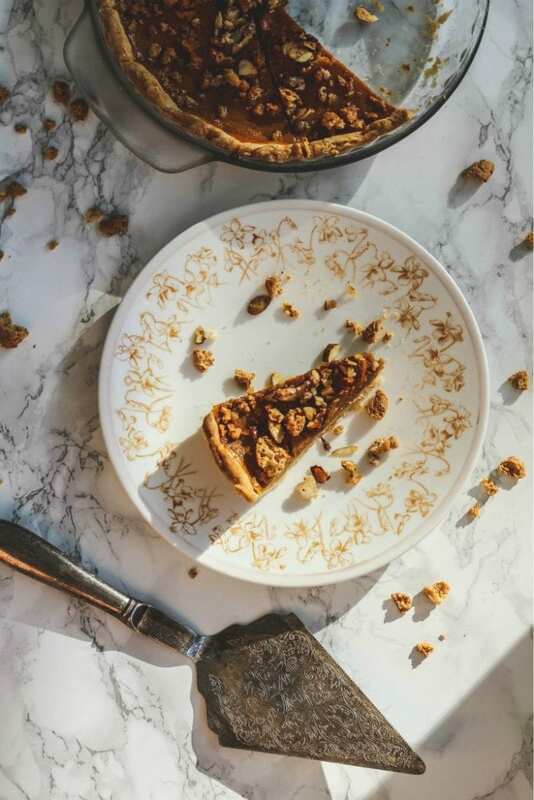 While pie bakes, make the praline: Line a baking sheet with parchment paper. Brush with a bit of vegetable oil. In a small saucepan, stir the sugar and 1 Tablespoon water and bring to a boil, swirling until it is amber colored (about 6 minutes). Stir in the almonds and salt. Pour almond mixture onto the baking sheet spreading thin with a spatula. Let cool completely. Coarsely chop the amaretti (I put them in a large zip plastic bag and crush them into large pieces). Coarsely chop or break the praline. Cool pie for 30 minutes. Refrigerate 4 hours or until chilled. 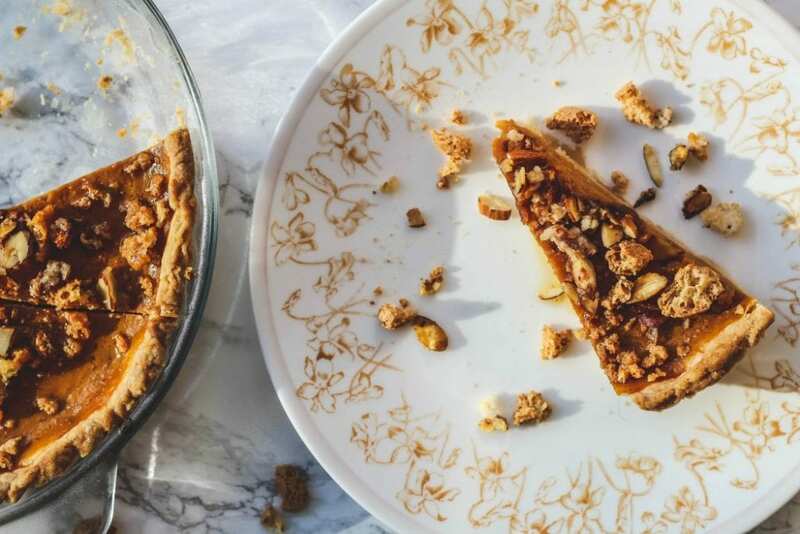 When pie is chilled, sprinkle the amaretti and almond praline on top. Now, this recipe will be one of my favorites. Looks incredible! 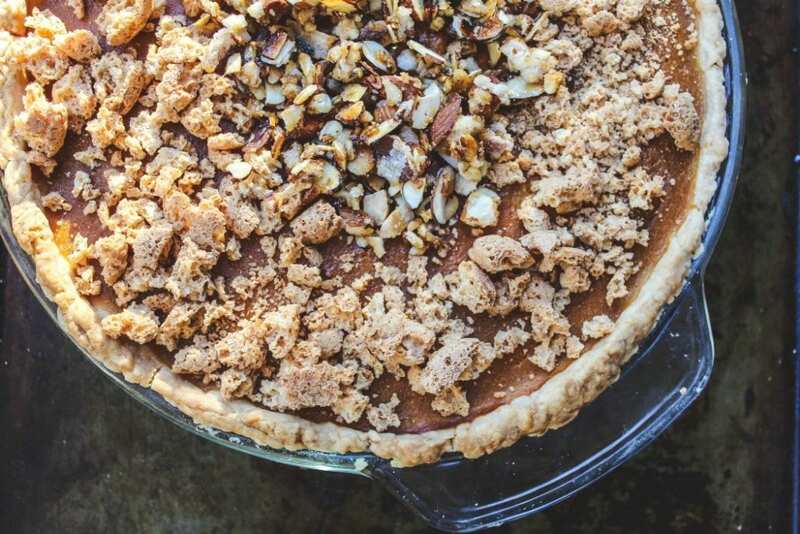 This Amaretti Almond Pumpkin Pie looks sooooo good! Yummy! This made me drool. Thank you for a great recipe! I love homemade pies! 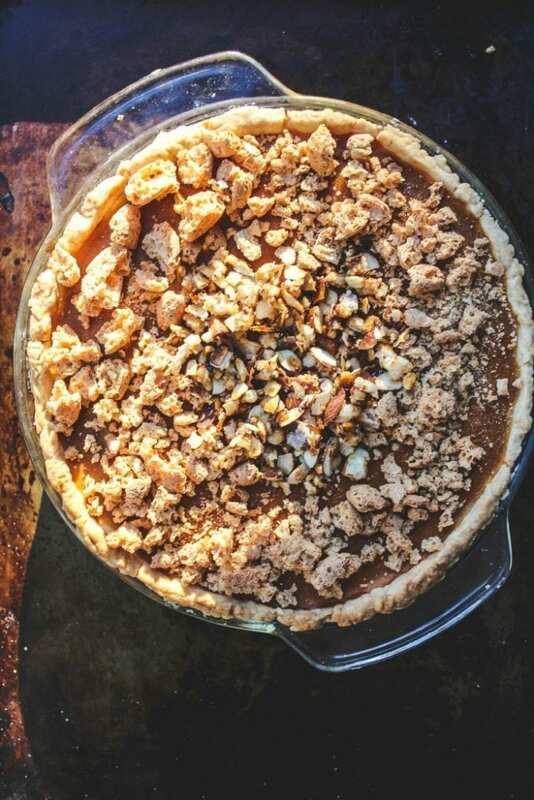 This Amaretti Pumpkin Pie looks heavenly! 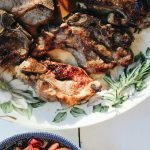 A must try recipe! 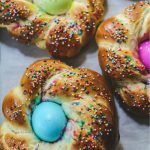 What a fabulous Italian twist on an American classic! I love this so much! I wish I had a big slice of this for dessert tonight! Pretty sure I could eat pie all day if this is what I was eating! This pie is calling my name! Looks SO good!